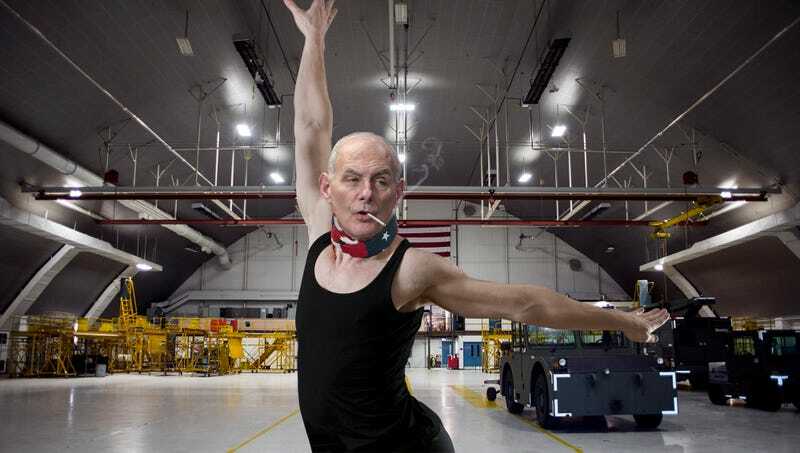 WASHINGTON—Wearing a leotard and chain-smoking as he pounded out the measures with his cane, White House Chief of Staff John Kelly screamed, “It’s step, twist, step, dammit!” at a group of Marines on Wednesday as they learned the choreography for President Trump’s upcoming military parade. “Jesus Christ, how many times do I have to tell you it’s step, twist, step, shuffle, lean-and-point, and point-and-roll?” a visibly furious Kelly said as he threw a chair across the military hangar, removed his scarf, and commanded the battalion to “just watch [him]” as he demonstrated the dance in front of a full-length mirror. “Again, do it again! We’ll stay here all night if we have to. Seriously, you call yourselves dancers? It’s like I’m working with a bunch of goddamn amateurs.” After exploding at a private first class whom he sent home for wearing the wrong boots, Kelly told everyone they were taking a “quick five,” and that when they returned, they had better do it right or he would be making some cuts.